The Northern Red Bishop Euplectes franciscanus is similar to the Southern Red Bishop. In the breeding male Northern Red Bishop, the black extends further back on the crown than in the Southern Red Bishop, and the tail coverts are longer, concealing the tail. The Northern Red Bishop is smaller than the Black-winged Bishop, with a small bill, brown wings and a short brown tail. The female and non-breeding male are indistinguishable from the Southern Red Bishop, and are distinguished from the Black-winged Bishop by having paler underparts, and in flight by its brown wings. The Northern Red Bishop is less streaked below than the Yellow-crowned Bishop, and the supercilium is short and white. The Northern Red Bishop occurs across Africa from Mauritania to Somalia (see map below, based on Birds of Africa). Several subspecies of the Northern Red Bishop have been described but are no longer recognised. It is resident over most of its range, but in the far north it is a breeding rainy season migrant. Escaped birds breed near Los Angeles, California, and in the West Indies. The Northern Red Bishop inhabits tall open or bushed grassland. It is closely associated with giant grasses and tall crops such as millet and sorghum, but also occurs in open habitats with rank weedy vegetation. At night it roosts in thickets or tall grass. 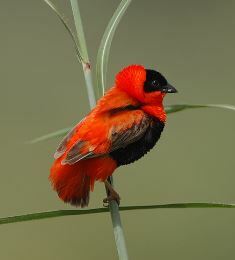 The Northern Red Bishop feeds on small grass seeds and insects. Young nestlings are fed mainly with insects. Birds forage mostly on the ground by hopping. Insects are caught both on the ground and in flight. It is gregarious, and forms large flocks in the non-breeding season, associating with other seed-eaters. 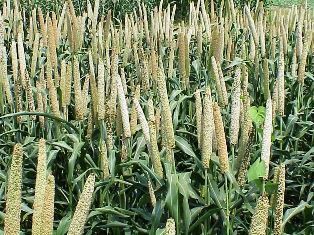 Flocks damage crops, and seeds of millet and sorghum are favoured. In Ethiopia flapping pieces of cloth are strung over fields to keep these birds away. The Northern Red Bishop is polygynous,and a male has up to 5 females. It is territorial, with boundaries well defined, but males may be clustered in a an area. It is less colonial and more specialized in nesting requirements, than the Southern Red Bishop. The nest is a globular structure of coarse grass. The nest is built by the male, starting with a vertical ring between supporting vegetation. The nest is lined by the female with grass flowerheads, which project from the entrance. The nest is supported by grass or weed stems l-2 m above the ground; it is rarely placed in bamboo, bushes or trees, 3-6 m above the ground. Nests are also sited in crops including rice, sugarcane and millet. The density of nests in millet is 10 times that in wild grasses. The eggs, 2-4 in a clutch, are plain blue (similar to those of the Southern red Bishop, but slightly smaller). Only the female incubates the eggs and feeds the chicks. The Northern Red Bishop has no PHOWN records (see PHOWN summary). Submit any weaver nest records to PHOWN (PHOtos of Weaver Nests) via the Virtual Museum upload site.